Can wine in kegs be any good? As beverage manager I can not only focus on spirits on cocktails, but I do have also think about wine. Thus I have got a subscription to WineSpectator, which is admittedly quite awesome. 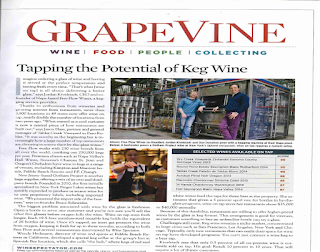 In the current issue, there is a very interesting article about keg wines - wines which are not bottles but rather filled into a keg - and which have their own "keg tap system" - as (as pointed out) it is not enough to use the existing beer taps. Personally I do think, that it could turn some people off (there is still a lot of controversy about using screwcaps - people, get over it!) - and especially guests of bars, restaurant and hotels might feel affronted of such innovation. The wine business is really traditional - and there are a lot of people, which are opinionated and against progress throughout the consumer groups - from the connoisseur and collector to the novice. However I do honestly believe, that such system (if properly installed) totally outweighs the negative comments of naysayers - it is a bit funny for me, to communicate my interest, because I was always rather less optimistic about the "bottle draft systems". But I think, between one of these precursor and the "future" (keg systems) is definitely a big difference. 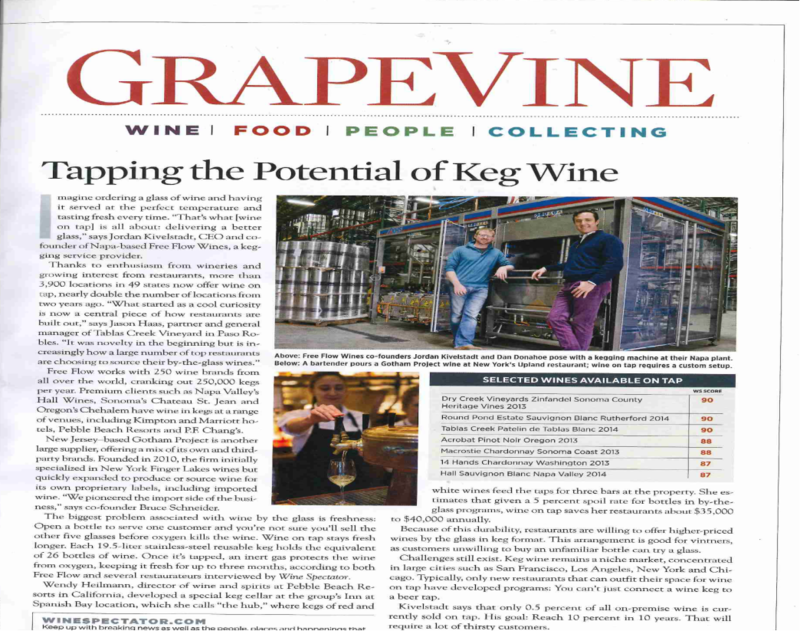 Kegs (due to their size) give better opportunities to save (due to bigger quantities - as per the article one "usual" keg has 19.5 liters. Further the system (anti-oxidation) is far bigger scaled... I have had always the feeling, that the bottle taps were elaborate toys... The chilling is also far more profound. And personally it just feels different. It seems not to be a compromise. Obviously you can not only serve a glass, but also carafes, which is also quite interesting and a new and trendy-rustic way of serving wine. And it also would probably help to use more wine in mixed drinks as well! One point is obviously the quality - not the quality of the keg - but the quality of the wine, filled in the keg. But unlike when box wine started and you could find only rotgut in this packaging (nowadays more and more quality wines can be found as "box" as well), WineSpectator reports, that there are quite some reputable name under the labels who fill wines into kegs. So what do you think? Are you against this innovation and feel, that wine looses its culture, or are you with me, to see the opportunities?